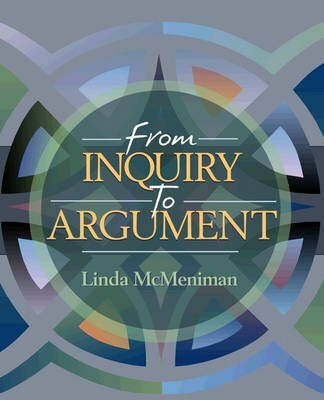 From Inquiry to Argument blends inquiry, research, and argument by interweaving a discussion of argumentation strategies with instruction in critical thinking and research skills and with writing tasks important to research and argument. Most textbooks emphasize either argument (and ignore the need to discover sources and information) or research (and de-emphasize argumentation as a motive for seeking source material). From Inquiry to Argument develops students' abilities in argumentation and research simultaneously. This approach gives students a reason to research - to find ideas and information for their arguments - and also helps them build better arguments by teaching them how to analyze and generate ideas and perform research in primary and secondary sources. From Inquiry to Argument teaches the process of researching and constructing an argumentative research paper. It covers academic documentation in both MLA and APA styles, while also addressing informal source reference. Numerous professional readings as well as nine student writing samples expose students to different types of writing and provide a base for primary research. The coverage of argument addresses such related topics as critical thinking, logic and fallacies, and the appeals, and presents Toulmin logic as a touchstone for the discussion of argument.